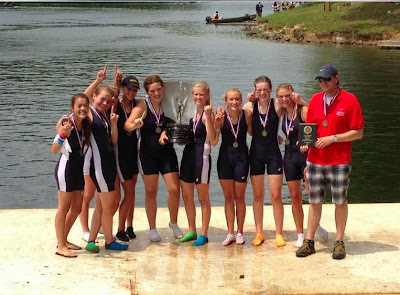 ...and the Women's Junior 8! Hannah Fisher named to the US Rowing Scholastic Honor Roll! PRINCETON, N.J. – Thirty-six student athletes earned spots on the 2016-17 USRowing Scholastic Honor Roll, and another 36 student athletes earned honorable mention honor roll recognition, the organization announced Tuesday. The USRowing Scholastic Honor Roll program has been in existence since 1992. This year, 120 nominations were received from athletes representing 64 clubs and school programs across the U.S. A particularly strong group of applicants with very high GPAs and test scores, their rowing accomplishments ranged from success at the 2016 Junior World Championships, USRowing Youth National Championships, USRowing Club National Championships and various regional league/district championships. Thomas Holtslander named to the USRowing Scholastic Honor Roll! Alumni Shannon Haines Named to CRCA All-Mid-Atlantic Region First Team! 2015-2016 Women's Second Four are State Champions!